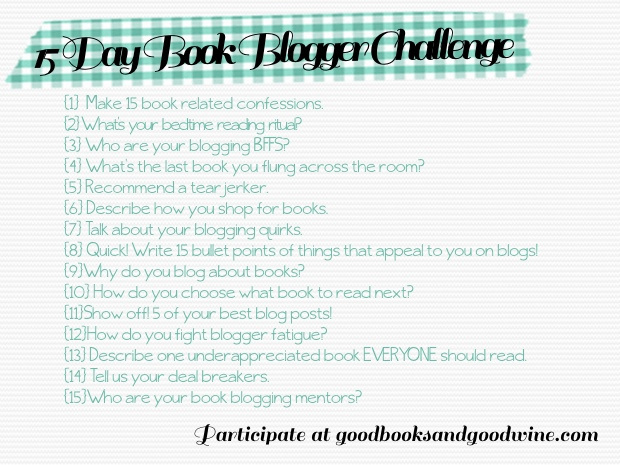 Feeling Fictional: 15 Day Book Blogger Challenge: Day 9 - Why do you blog about books? The Day 9 topic is: Why do you blog about books? When I first started by blog way back in January 2010 (has it really been nearly 4 years since I started blogging?!!) it was just because I wanted a way of keeping track of what I was reading. I've always been a bookworm who devours a ridiculous amount of books but I found myself picking up books in the shops, reading the back and struggling to remember if I'd already bought and read it or if it was one I'd just looked at and added to my wish list (you have to realise that was before I discovered the miracle that is Goodreads and was able to double check myself within seconds!). I had a personal blog at the time and thought this would be a good way of keeping track of the books I'd read and what I thought of them. At the time I had no idea that the whole book blogging community existed so it was purely a personal thing and I never expected anyone would be interested in reading my rambling thoughts. But what do you know, before long I found this wonderful community of bloggers who were so incredibly supportive and welcoming. I found fellow obsessive bookworms who loved to chat about books just as much as I do and I was even lucky enough to meet up with a few of the UK YA bloggers so we could rave about books face to face. I can't tell you how shocked I was when a publisher first contacted me about reviewing books for them, I'd only just started to learn about things like ARCs and review copies and was thrilled when I started receiving them for myself. I still get incredibly excited when a package comes through the post or I receive an email about an upcoming release but I can honestly say that even if I never received another free book I wouldn't stop blogging. I still buy an insane amount of books, swap books with friends, borrow books from the library and add them to every birthday and Christmas list so I'm not going to be running out of reading material any time soon! I feel privileged to be sent books and it's something I'll never take for granted but what I appreciate most is the people I've met since I started blogging. Other bloggers & Goodreads users who have now become amazing friends, the fantastic publicists who help feed my addiction and of course all the wonderful authors who have taken me on so many different adventures. I've been lucky enough to attend some amazing events and take part in things I'd never have done if I hadn't started my blog. I never expected to last more than a month but now, nearly 4 years and over 1,600 posts later, it feels like I've been doing it forever and I can't imagine ever stopping!